Okieladybug's Scrap N' More: Card From Some of My Stampin Up Goodies! I have wanted the Stampin Up butterfly punch and some of their stamps like FOREVER!! I was able to get both when I had my party last month. This is the first project I have been able to make with my goodies!! So I totally cheated and got the "map" for this card from PAGEMAPS. I so love that site and go to it frequently when I need some inspiration! I stamped the butterfly on some coral cardstock with the Versamark ink and then added embossing powder and heated until glossy *okie thinks she is so silly sometimes by giving such explanations but she figures if she doesn't that will be the time someone asks*. I punched a butterfly out of red to make a base for the coral butterfly to go on. I added the pearls with the Irock tool for the body and then just drew on some antenna. The scallop circle is on mounting foam to pop it out from the card base. 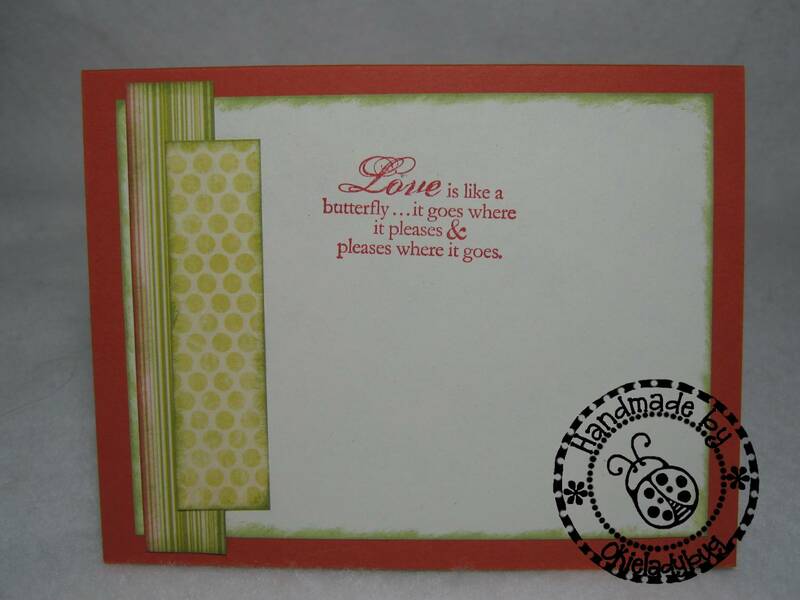 I was going to use something different for the inside sentiment but when I got the card done it just seemed to really fit so I just used the sentiment that came with the stamp set. 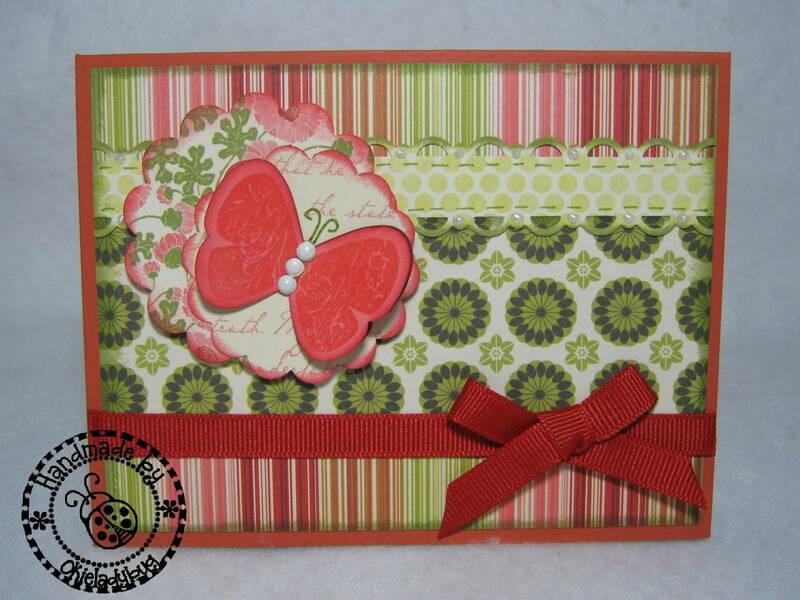 Once again I decorated the inside of the card with some of the scraps I had left. Here is a close up of the dots I did with the Pearl Pen. My friend Carol with two hearts sent this to me quite some time ago and I coudln't ever get the thing to work right. I decided to try it again and low and behold I got it to work! What I did was squeeze lightly until a little was coming out of the tip. I then lowered it to the paper, not touching the tip of the bottle on the paper, and the pulled away at a slight upward angle. This seemed to eliminate the flattening or "hershey kiss effect" I got when trying these before. Now that I have the hang of this........I WANT MORE!! Cute card! I have read about/seen those Viva Decor Pearl pens, but I can't ever find one to try it. WHere does Carol get hers? What a beautiful card--love the pearls!! Glad you posted this. I'm running out of ideas and you KNOW I have that paper and punch! LOL! I want to see it in person since you said you put red under the coral on the b-fly. That's not a combo I would have ever though of using, for sure! Love the card !!! That is a great butterfly ! I love butterflies ! This is so pretty! I love how you used the irock for the body, that worked perfectly. Beautiful card.I didn't know IRock did pearls too. Very cool. I am off to check out PAGEMAPS. 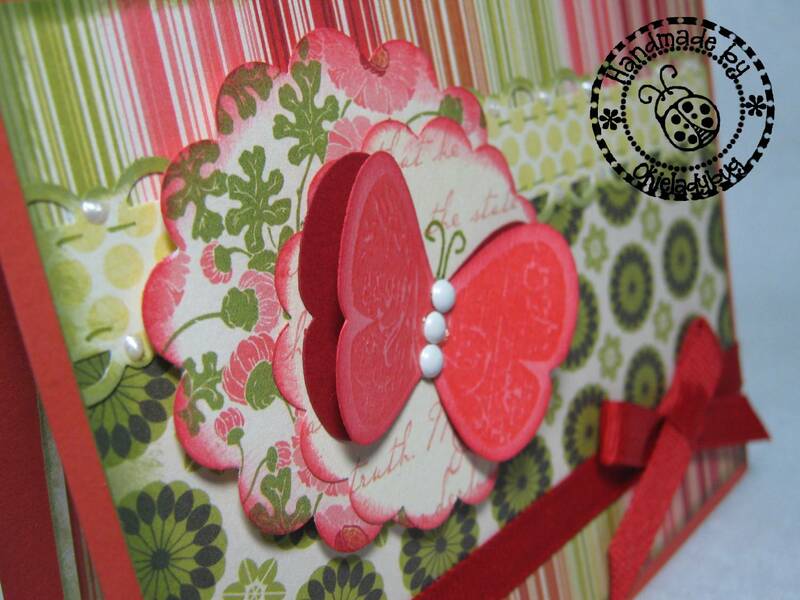 The card is really great and the sentiment is a perfect compliment to your design. 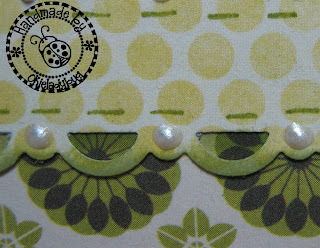 I like the idea of using scraps on the inside. TFS. You always do such pretty work Okie!